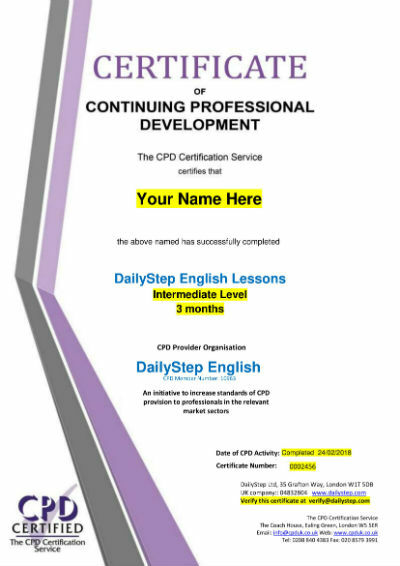 If you would like an official certificate when you finish your DailyStep English Lessons, please contact me at jane@dailystep.com. I will check your Lesson Bank to verify that you have successfully completed all your DailyStep Lessons. If you have successfully completed all the lessons in your subscription, your Certificate of Continuing Professional Development will be sent to you by email. You can show this to an employer or university, and each certificate can be verified as genuine. You need to study DailyStep English for at least 1 month to gain a certificate. If you are not ready to start, you are welcome to sign up for a Free Trial, or take this Free Test to find your correct level.